Or rather their Eco Shop. 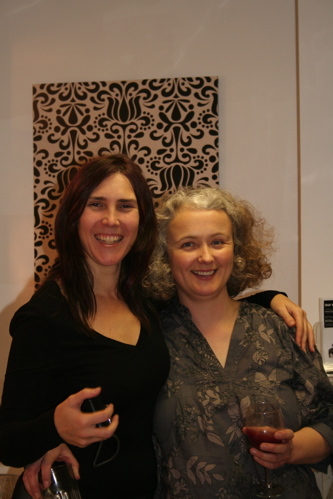 This is Lisa and Bridget who opened their new shop on Friday night. Take a look at that Mod Green Pod wallpaper behind them. Harlands Organic Furnishings (available at Our Eco Shop) are the sole supplier of this fantastic eco wallpaper & fabric in the UK. How very cool. They are also making the only truly organic upholstery in this country. Impressive! Outside & Inside. Good nibbles too. 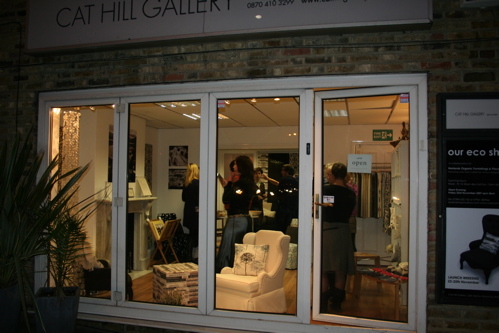 Fabulous shop, well done you guys! There is also some self-interest on my behalf, they are stocking my Mantua Frill range and Amelia brooches. I’m delayed in putting all this up by a whole rush of stuff. The Eco Design Fair on Saturday, which was far too quiet, despite loads of fabulous stuff. A party on Sunday celebrating the two-year anniversary of a sucessful bone marrow transplant for this little angel. What better reason to celebrate? A meeting with my publisher. It’s really, really exciting! Toothache and tooth extraction. Not so good, but all better now, as long as I keep eating slop. Preparing for my open studio on Saturday. And catching up on a bit of sleep! 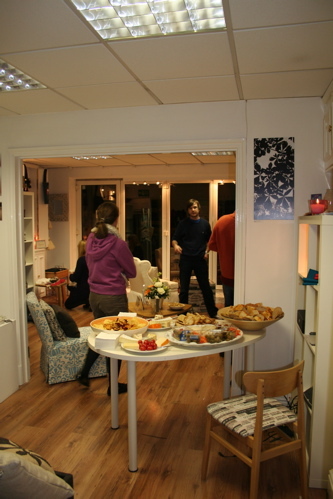 i wish i was close enough to pop into you open studio!